During summertime in the South, it can get too hot to even think turning your oven or stovetop on. Luckily, hot summer temps don’t have to hold you back from exploring delicious new recipes. These no-cook appetizers and salads showcase the best of summer’s gorgeous produce. Without having to put much work in, you can still show up at the church potluck or neighborhood cookout with the prettiest appetizer or salad in sight. Whether you’re in the mood for an old-school no-cook appetizer like pimiento cheese or crab dip, or you want to branch out with no-cook recipes that will be new to guests like pimiento cheese-stuffed pickled okra and West Indies crab salad, these no-cook recipes have your back for every event. Busy weeknights call for quick, easy dinner recipes, and these no-cook salads fit the bill beautifully. Don’t waste a minute of summer standing by the stovetop. These no-cook appetizer and salad recipes are summertime saviors. No need to break a sweat assembling all the rolls yourself. Make a small batch to kick-start the party, then offer a platter of the fresh ingredients with the dipping sauce so guests can build their own. Just dip the rice paper sheets in hot water as directed, and wrap with a damp towel to keep them soft. Look for rice paper rounds in the international aisle of large grocery stores or Asian markets. No Southern appetizer board is complete without spicy-sweet pickled okra. Our new obsession: Wickles Wicked Okra (wicklespickles.com). We also recommend Olli Salumeria salami, slow-cured in Virginia and found in gourmet grocery stores across the South, but you can choose any of your favorite cured meats. Combine sweet, juicy watermelon chunks with fresh tomato, onion, and a red wine vinaigrette for a salad that is the essence of summer. If you'd like to assemble the salad ahead of time, reserve croutons until just before serving; store in the refrigerator. English, or hothouse, cucumbers have thin skins, few seeds, and mild flavor. English cucumbers are sold wrapped in plastic, rather than coated in wax. 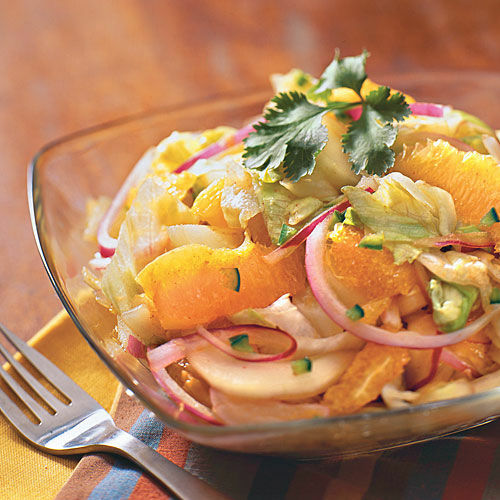 This recipe is a fresh way to use citrus. Sprinkle toasted sweetened flaked coconut over each serving, if desired. Create a colorful and healthy salad by combining mango slices, tomato, cucumber, corn, basil, and a lime vinaigrette, then tossing with arugula. You can prepare this salad a day ahead, but don't cut up the avocado or add garnishes until just before you serve it. Double the recipe—as we did here—for a dramatic presentation that will feed a large group. Fresh lump crab is the star of this easy dip recipe, and the flavor of Lowcountry favorite Old Bay seasoning shines through. This farm-fresh salad might be the prettiest way to use up that rotisserie chicken in your fridge. This springy cheese ball will brighten up any cheese and charcuterie platter. This is the perfect mixed green salad. With a bright, tangy vinaigrette, it’s the perfect accompaniment to a main dish like grilled steak, fish, or chicken, or a beautiful starter salad. This summery chilled soup is the perfect appetizer for an outdoor dinner party—dressy but cool. Your guests will never know this colorful, light salad was made with shrimp you didn’t cook yourself and microwaveable rice, but they don’t have to. A summer-favorite side dish gets appetizer treatment with this easy dip everyone will love. This fresh, 15-minute appetizer gives us another reason to love store-bought rotisserie chicken. No one will guess that the most beautiful summer salad to hit the potluck only took you 10 minutes to throw together. These veggie bites are a hostess-favorite appetizer. Why? They look pretty, they’re easy to grab-and-go, they’re not messy, and they’re so easy to put together. This springy update on a classic coleslaw recipe is light, bright and oh-so-pretty. You can make a gorgeous platter of crudité and homemade pita chips to surround this Southern spin on classic hummus. 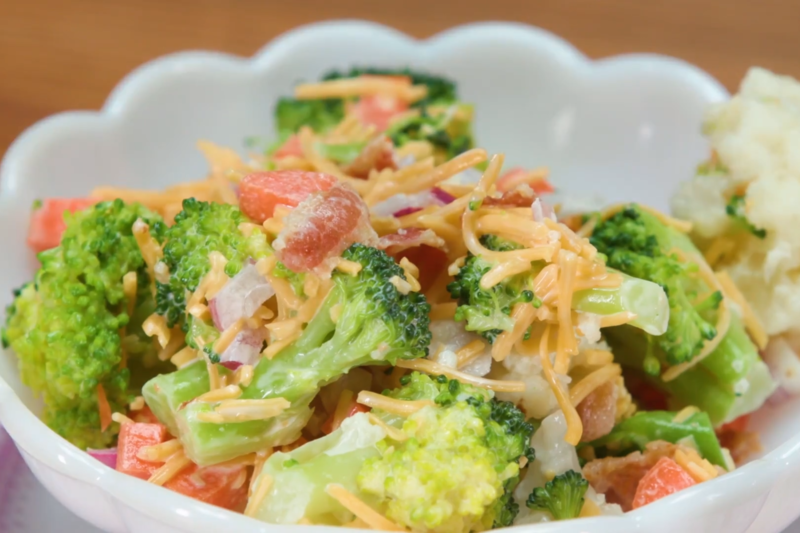 Add something fresh to the cookout spread with this easy, colorful salad. This bite-size version of a melon salad has the perfect sweet-salty balance. 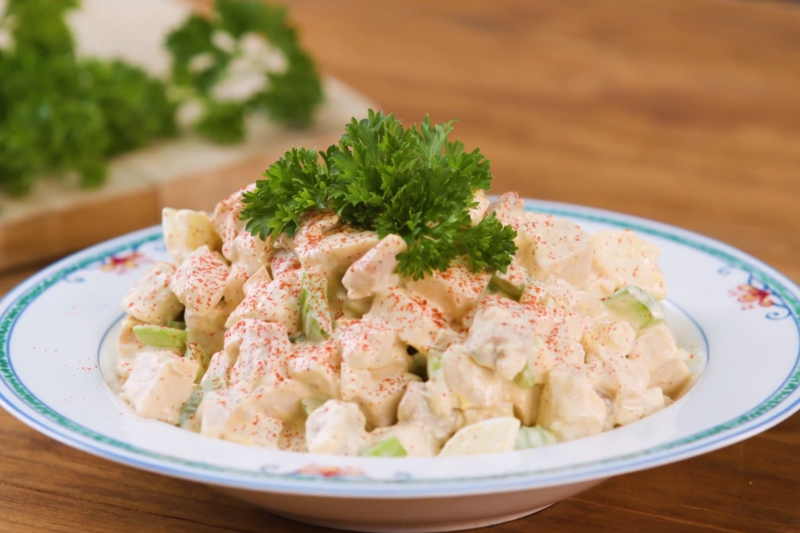 There’s no need for fuss: This simple chicken salad recipe will do the trick at any luncheon. Sweet, salty, tangy, smoky—this crunchy slaw recipe has it all, and everyone will be begging for your secret. Celebrate spring with this fresh salad that can be served over French baguette slices as an appetizer or mixed greens as a starter salad. 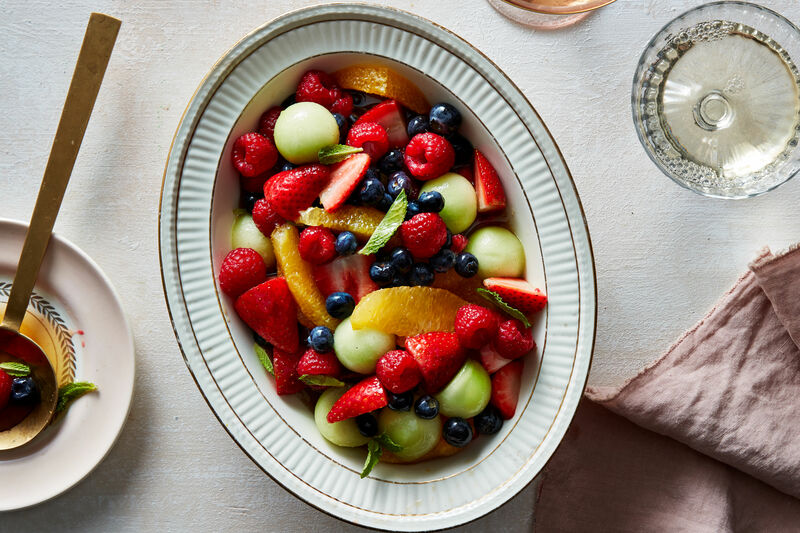 Every luncheon, potluck, and brunch spread could use a simple, delicious fruit salad, like this lightly dressed one. This fresh salad is full of beautiful produce and topped with our own homemade Green Goddess Dressing that you’ll want to keep in the fridge for good. This summer stunner showcases all those gorgeously fresh fruits and veggies you picked up at the local farmers’ market. This rich homemade dip is so much better than store-bought, and yes, guests will be able to taste the difference. This starter salad is endlessly elegant but so simple to make. This crunchy, festive slaw recipe combines sweet pineapple with spicy jalapenos for a side dish that can get the party started. What’s a shower or luncheon without an arrangement of tea sandwiches? This recipe takes a Southern classic and makes it portable for parties. This fresh salad is a sunny starter or perfect pair with a hearty main dish protein like steak, chicken, shrimp, or fish. This might be a simple pimiento cheese recipe with very few ingredients, but it surely doesn’t taste basic. Set it up with crackers and crudité or make tea sandwiches with it for easy grab-and-go access. The only directions needed for this pretty salad? “Stir together all ingredients.” You’re welcome. Hosting a summer dinner party? Impress everyone with this lovely chilled soup that only takes a blender and a little time in the fridge. This healthy yet hearty salad is bright and beautiful for your table, and store-bought rotisserie chicken comes to the rescue yet again. 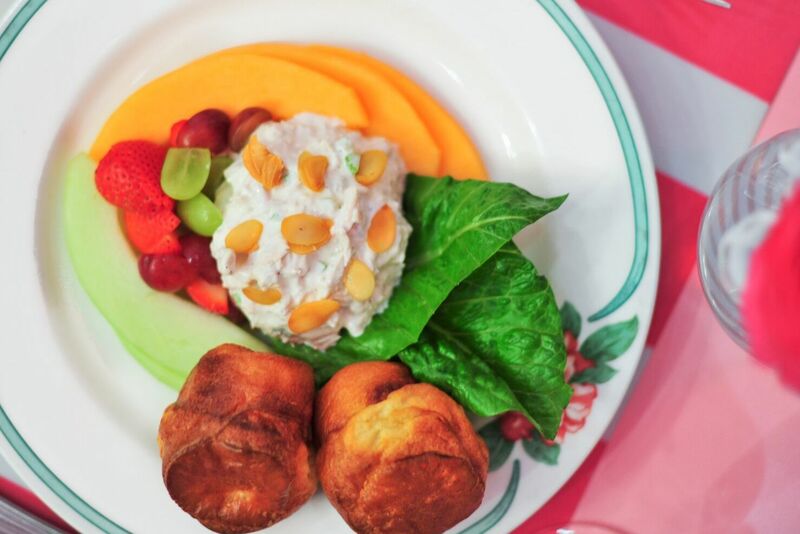 Step aside chicken salad: Whether with crackers, cheese puffs, croissants, or in tea sandwiches, your friends will love this old-school recipe at the luncheon or potluck. If you love to try new ways with good ole guac, this will be your favorite, guaranteed. You just need six ingredients and a veggie peeler to throw together this pretty summer salad. At appetizer time, there’s something nostalgic about a classic relish tray. This easy bite comes together quickly, but the cream cheese, honey, and walnut filling is to die for. This fresh, crunchy slaw has everything you could want in a side dish, and the presentation is much prettier than the time you spent on it would let on. These savory bites are the easiest appetizer for guests (and hostesses) on the move. Showcase fresh lump crabmeat with this old-school recipe from Mobile, Alabama. Guests who haven’t had it before will fall in love. This salad is beautiful enough for a holiday spread but easy enough for a last-minute get-together. No one wants to ruin their appetite on heavy appetizers before an amazing dinner. These fresh bites strike the perfect sweet-savory-salty balance without getting your guests too full pre-dinner. Summer produce shines in this simple salad that will start the meal off on a bright note. This tailgate-favorite dip is actually pretty healthy, so go ahead and dig in. This fun appetizer is about as Southern as it gets, and it’s so ideal for a casual cookout. If you don’t have time to make corn pudding before the potluck, no worries! This no-cook salad has all the fluffy goodness you crave. Everything you love about Caesar salad, in pick-up form! Don’t fuss with tossing a salad (or said salad getting wilted and soggy during the party) with this colorful starter. This Greek-inspired side dish is fresh, easy, and only gets better the longer it marinates. Take the stress out of entertaining with a cheese ball that doesn’t stand a chance at providing leftovers once guests taste a bite. This quick salad recipe is bright and fresh to accompany any main dish. This four-ingredient appetizer looks beautiful but takes basically no work on your end, which makes it a busy hostess win. We updated the classic caprese with farm-fresh cherry tomatoes for easy big-batch serving.